We have developed three different types of bedside lamps: model 6510-11 has an integrated switch in the frontal center of the base. This model has a movement of 180 degrees of the head and 320 degrees from the base, as well. This makes it as the most complete model when we think about movement. Model 6512 base is fixed but, head rotates 300 degrees from the base and head inclines up to 90 degrees. All these models uses direct LED to 230 V. from company Acriche with 4 W of power and 300 lumens as light output. 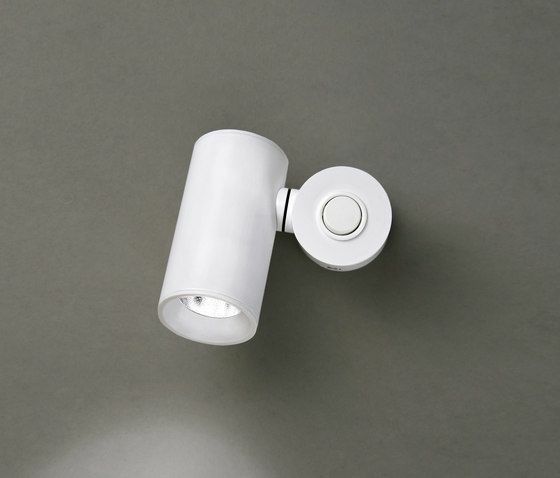 Model 6513 would be the most complete beside wall light as together with the movements of the spot head we have added an indirect wall light using two DOB with 4,4 W. and 400m lumens of light output each one. Finally, we have completed the TUBLED series with a spot light for being recessed and a two lights ceiling light in which central tube is fixed but, it turns 320 degrees on its axe and, lateral spot has 180 degrees of movement over its own axe, as well. Series comprising ceiling lights, wall lights, pendant lights and adjustable spotlights based on an elegant design with clean lines and pure geometrical forms. It incorporates a 4 W direct LED delivering an output of 160 lumens, with a colour temperature of 3000 K and colour rendering property of 80 Ra. The reflector, specially designed for this model with a 35º aperture, aids in reflecting the light thanks to the shiny interior finish used. Three injection-moulded aluminium parts (base mount, LED mount and reflector) improve the model’s quality and aid in series production, providing great value for money. Both the main tube and the base are manufactured in stainless steel. Available in two finishes: polished stainless steel with black satin lacquer for the base and LED mount, and white satin lacquer with the same black lacquer trim. This product contains built-in LED lamps belonging to energy classes: A+ Energy classes on a scale of A++ (highest efficiency) to E (lowest efficiency). Since 1960 MILAN Iluminaci—n have been committed to the distinctive Design of its products, to maintaining standards of Quality in each and every one of the components used in manufacturing our lamps, and to providing our clients with a conscientious Service.